Mass cytometry is a method that combines flow cytometry with inductively coupled plasma mass spectrometry (ICP-MS). The fusion of these two technologies facilitates the simultaneous analysis of over 40 cellular parameters on a single-cell level, enabling the investigation of complex cellular systems. The usage of metal labeling instead of fluorochome conjugation, as used for conventional flow cytometry, results in none to minimal spectral overlap. 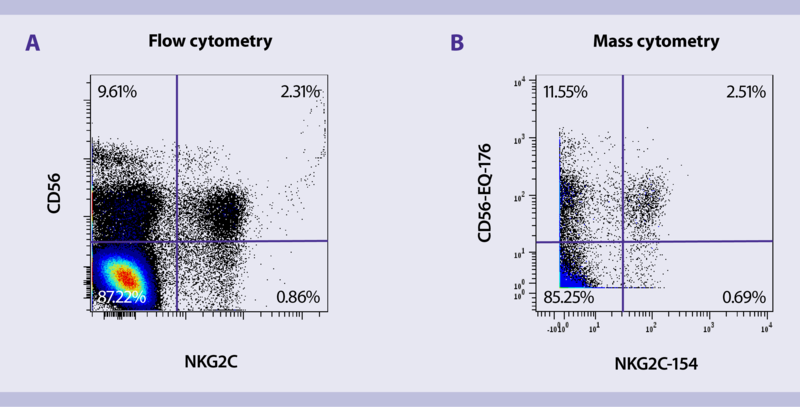 As a high-parameter technique, mass cytometry depends on standardized antibodies that ensure consistent performance. To improve your data quality when it comes to mass cytometry, we have extended our portfolio to include recombinantly engineered antibodies specifically optimized for CyTOF® applications. 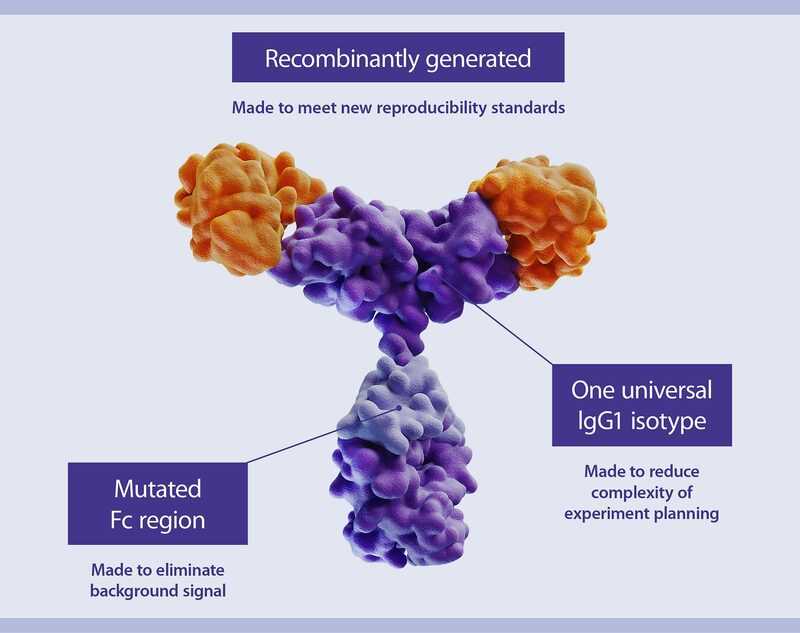 Every REAfinity Antibody comes as a human IgG1 isotype. The pure antibodies are provided at a concentration of 1 µg/uL in aqueous buffer and are therefore optimized for conjugation with heavy metal isotopes. The usage of the same recombinant antibody clone for both flow cytometry and mass cytometry assays contributes to standardization efforts, providing highly comparable and consistent results. with CD159c (NKG2C)-PE (REA205) and analyzed using flow cytometry. (B) The same sample was stained with the metal-conjugated pure version of CD159c (NKG2C) (REA205) and analyzed using mass cytometry. Data courtesy of Prof. Karl Johan Malmberg, Oslo University Hospital, Norway. Using REAfinity Recombinant Antibodies for mass cytometry experiments will help to improve your results by reducing antibody-dependent variabilities. 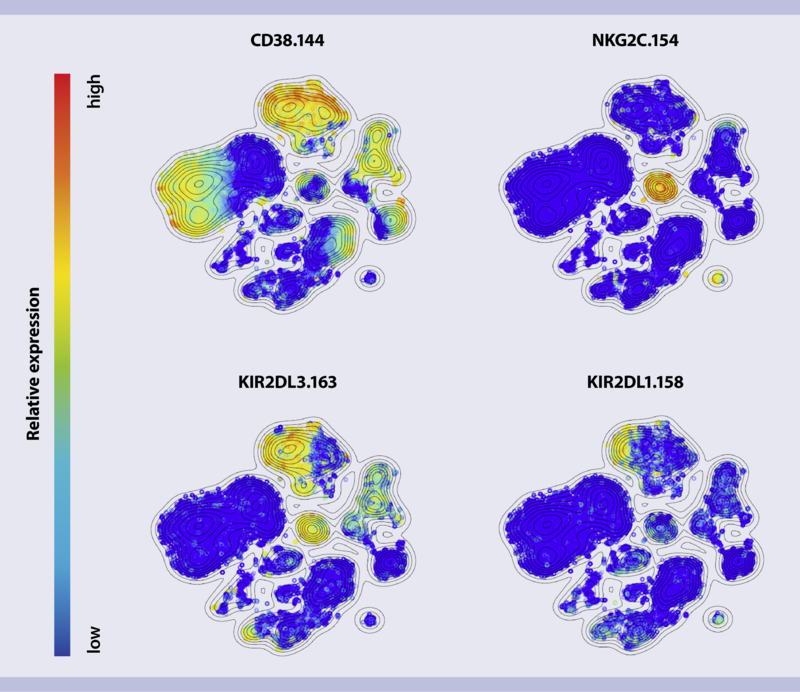 An example of performance data using REAfinity Antibodies for the characterization of natural killer (NK) cells shows sensitive detection of both the more broadly expressed marker CD38, as well as very specific markers such as NKG2C, KIR2DL3, and KIR2DL1. Expression pattern of CD38, NKG2C, KIR2DL3, and KIR2DL1 in human PBMCs. After gating on all living cells, expression of the respective markers was visualized by viSNE analysis. The clustering was performed on 35 different antibodies. The following REAfinity Recombinant Antibodies were used for staining: CD38 (REA572), CD159c (NKG2C) (REA205), CD158a (KIR2DL1) (REA284), CD158b2 (KIR2DL3) (REA147). Data courtesy of Prof. Karl Johan Malmberg, Oslo University Hospital, Norway. You cannot find your desired antibody or size? Request your custom antibody now! Every antibody clone can be requested as a pure version for CyTOF® applications.